OUTER BANKS, N.C.– The distinct villages of the Outer Banks have much to explore, from the many shops and restaurants of the Northern Beaches, to the historical attractions and quaint communities of Roanoke Island, to the environmental tranquility of Hatteras Island. Guests can enjoy a diverse range of accommodations to suit any lifestyle and budget, from quaint beachside motels and diverse beach home rentals to historical bed and breakfast inns and scenic campgrounds. Whether it be a family vacation or reunion, a romantic retreat for two, a fishing trip with one’s buddies or a historic and cultural pilgrimage through the destination’s rich past, all will find something to suit their housing needs. Following is a sample of what’s available on the Outer Banks. The Outer Banks boasts more than 2,900 guest rooms in a diverse range of hotels and motels. For vacationers seeking moderately priced lodging, the Best Western Ocean Reef Suites in the town of Kill Devil Hills on the Northern Beaches is one of the Outer Banks’ only all-suite, oceanfront hotels. It’s conveniently located to shopping, a variety of historical and recreational sights and some of the country’s best fishing. On Hatteras Island, guests may stay at several moderately priced favorites, including the Comfort Inn, Buxton, which is close to charter fishing, shopping in Hatteras Village, the Cape Hatteras lighthouse, the Ocracoke Ferry and Pea Island National Wildlife Refuge. You may also want to check out the Outer Banks’ two newest luxury hotels, the Hilton Garden Inn in Kitty Hawk (252-261-1290) and Oasis Suites in Nags Head (252-441-5211). For more personal service, guests may enjoy the many comforts of home in one of the Outer Banks’ bed and breakfast retreats. Tranquil House Inn is located on the waterfront in downtown Manteo and surrounded by boardwalks, sailboats and Shallowbag Bay. The Inn offers unique rooms with canopied, four-poster beds and suites with cozy sitting areas and separate bedrooms. Another favorite is the Roanoke Island Inn, close to Roanoke Island Festival Park, Elizabethan Gardens, the North Carolina Aquarium, Fort Raleigh National Historic Site, Waterside Theater and the popular Christmas Shop. In Nags Head, guests will find First Colony Inn, where they will experience unique rooms with English antiques, breakfast buffets and afternoon tea. Enjoying the southern charm of this inn, guests lounge by the pool, read in the library, play croquet on the lawn or relax in a rocking chair on the verandah. Nearby activities abound, as vacationers may picnic on the Cape Hatteras National Seashore or dine in a fine restaurant; watch birds in the Pea Island National Wildlife Refuge or spend an afternoon at the North Carolina Aquarium; dive on a sunken ship or take an aero-tour, windsurf or hang glide. Cypress Moon Inn, located on the Currituck Sound in Kitty Hawk, and neighboring the Town of Duck, offers the convenience of nearby beaches, golf courses, restaurants, shops and other attractions. The Inn boasts waterfront guest rooms with private baths, private dining and semi-private porches. Guests can enjoy rooms furnished with antiques, entertainment centers with satellite television, stereo music and refrigerators. An alternative to hotels and inns that is becoming evermore popular is the option of renting one of 14,000 rental homes. The choices in location, style, size and budget are practically endless, from mansions on the ocean to inland bungalows. Vacationers can explore the diverse range of rental homes through local rental agencies such as: Village Realty, Sun Realty, Midgett Realty and Hatteras Realty – to name a few. On the Northern Beaches, in the town of Duck, the Sanderling Inn Resort & Spa can make anyone feel like a celebrity. Vacationers get pampered at the resort’s decadent spa, savor on-site luxury dining, stay active at the resort’s fitness center and tennis courts, cool off in the swimming pools, play on championship golf courses nearby, explore their adventurous side while sport fishing and appreciate the beauty of nature’s creatures at the 3,400-acre Audubon Sanctuary. For more information on the Sanderling’s amenities, rates and availability, visit www.thesanderling.com. The Cape Hatteras National Seashore operates four National Park Service (NPS) campgrounds along the Outer Banks. They are located at Oregon Inlet, Cape Point in Buxton, Frisco and Ocracoke and are capable of serving tents, trailers and motor homes. They are open from Memorial Day through Labor Day; and sites are assigned on a first-come, first-serve basis. The only exception is Ocracoke, which requires reservations. The only exception is Ocracoke, which requires reservations. To make a reservation, call (800) 365-CAMP (2267). Fees are $20 at each campground and, although considered primitive camping, they offer guests restrooms, potable water, unheated showers, grills and picnic tables. Vacationers may frequently check out www.outerbanks.org for information and specials on seasonal savings, in addition to enjoying savings with the Outer Banks Getaway Card. The card entitles guests to many values and deals throughout the area at local accommodations, restaurants and shops. 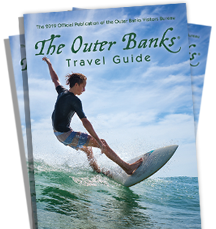 For more information or to receive a card to enjoy savings on a trip to the Outer Banks, call (877) 629-4386 or visit www.outerbanks.org.